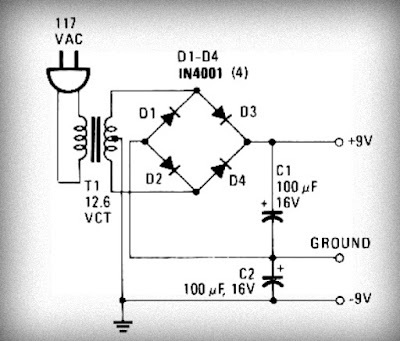 This is a very simple power supply and most popular to use. Because this circuit is simple and easy to make. Component required is Transformer ( CT transformer ) with output secondary 12 Volt, 4 diode , 2 Condensator Electrolit , Only this component you can make this power supply. In the first , voltage from AC 220V or 110V entered to the transformer and will be lowered into 12V AC . And then AC voltage will be rectified by 4 diode or you can use bridge diode to the DC voltage. And the DC voltage output will be filtered by Condesator electrolit and the voltage output ready to use . Its DC voltage with triple voltage (+) , (-) , and ground.